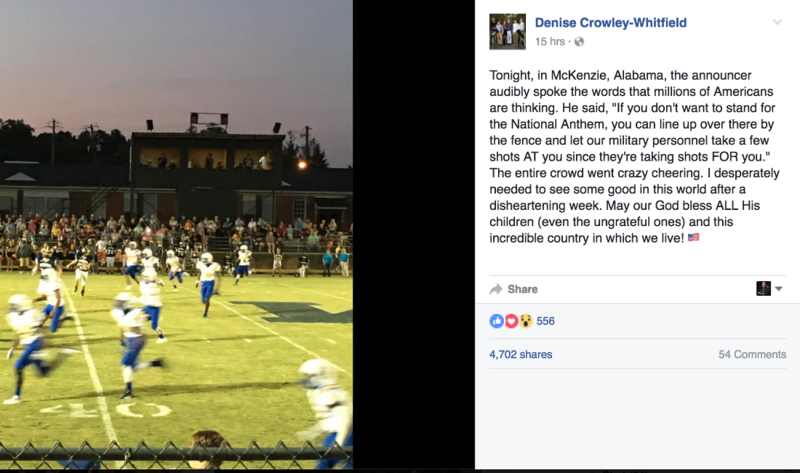 According to a Facebook post that’s been shared more than 4,700 times as of this writing, at last night’s McKenzie High School (Alabama) football game, the announcer told the crowd that anyone who didn’t stand for the National Anthem should be shot by our military. Tonight, in McKenzie, Alabama, the announcer audibly spoke the words that millions of Americans are thinking. He said, “If you don’t want to stand for the National Anthem, you can line up over there by the fence and let our military personnel take a few shots AT you since they’re taking shots FOR you.” The entire crowd went crazy cheering. I desperately needed to see some good in this world after a disheartening week. May our God bless ALL His children (even the ungrateful ones) and this incredible country in which we live! That’s Alabama conservatism for you. It’s considered “good in the world” when people who don’t think our country is perfect as is and want to see it improved should be shot by the military. Just to reiterate, people not standing for the National Anthem (or the Pledge of Allegiance) are not “ungrateful.” They understand that our country isn’t welcoming for certain groups of people. They know there isn’t really “justice for all.” They don’t believe we’re a nation “under God.” They think true patriotism involves more than singing a song or saluting a symbol. They love this country, but they want to draw attention to its flaws in the hopes that we can fix them. They live in the real world, not the idyllic place the people in that football crowd believe they’re in. And guess what? Many of them serve in the military, too. For what it’s worth, while Al.com says the statement hasn’t been verified beyond her Facebook post, I have seen screenshots from a source that show family members and relatives of Allen Joyner, a pastor at Sweet Home Baptist Church who also lends his voice to the McKenzie football games, congratulating him on what he said at the game. They are all very proud of his bloodlust. Donald Trump Wants to Unite the Country By Making Sure We All Live "Under One God"